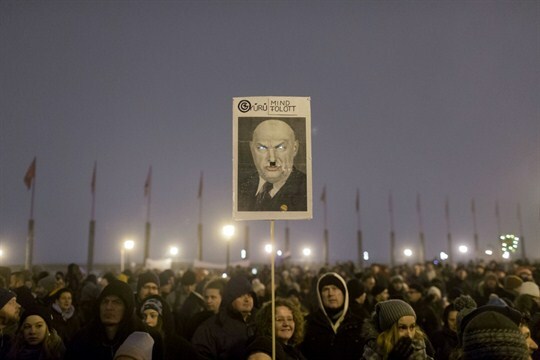 A protester holds a sign mocking Hungarian Prime Minister Viktor Orban during an anti-government march in central Budapest, Hungary, Dec. 21, 2018 (AP photo by Marko Drobnjakovic). Protests sparked by a new law that allows employers to demand 400 hours of overtime from workers each year, which critics have dubbed the “slave law,” have put Hungary’s disparate opposition parties side by side on the streets and in parliament. They need to expand this cooperation if they’re going to mount a serious challenge to Prime Minister Viktor Orban’s corrupt, authoritarian government.